"Here are some pictures so far in 2015 for the century club. Sailed the first four days of the year and the first and last day of January, February, and the first day of March. Managed 8 days in January but then only 4 days in both February and March. It was a rough spring. Sailed 6 days in April so with last weekend now up to close to 25 days. The pictures of the Sunfish are our group that sails every Friday, Saturday, and Sunday all year round in any weather unless it is so windy it is unsafe. That means winds greater than 20 knots for us on the southern Bay. It can get pretty rough. "First two pictures are from the Danna Dillon Memorial Race around Middle Ground Light on January 1. The next picture is our normal group. Myself, Jamie Chapman, Jay Boland, Chris Brichardt. Next picture us of my new Sunfish. It is the boat that win the Worlds in Oriental. Snow on Wine Down. Jamie launching through slush and ice to get to open sailing water. My granddaughter Tori Lofgren and I. We sailed through that ice and slush because it was the only nice day when she was.visiting. St. Patty's Day Dunk showing Jamie, Jay, BR Flowers, and Chris. Median age over 60. Finally warming up so we ditched the cold weather gear. Then it got colder but the same four suspects again. Did really well last weekend in a light air race around Middle Ground Light with Wine Down. Getting ready for a Memorial Day Cruise to Cape Charles with the Old Point Comfort Yacht Club and we are hoping to do the Summer Sailstice. 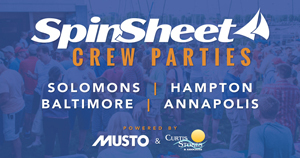 "May 16-17 is the Mid-Atlantic Regional Sunfish Race. I'll be out on the water for that." This man is going to hit 100 easily.